Las Fallas — the insane citywide celebration at the end of winter — is such a huge part of Valencian life that it has its own museum. If you’re not going to have the chance to experience Fallas, this museum offers a great way to get a sense of the festival’s scale and insanity. 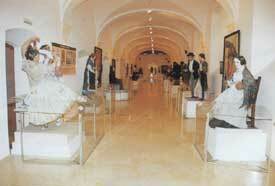 The museum takes visitors through the history of the Fallas, from 1934 onward. For each year, you’ll see the prize-winning ninots (satirical figures), the official poster, photographs of the winning Fallas monuments (which are burnt to the ground on March 19th), and painted portraits of the guapísima Falleras. There is a lot of information about how the Fallas characters are made, as well as a large model reconstruction of a mascletà square. Most of the enjoyment to be had in the museum comes from the ninots. These are frequently hilarious (and dirty), and properly flaunt the outrageousness and fun that festival is all about. All of the information in the museum is in Castellan and Valencian, but don’t let that put you off — you won’t need to read a lot, because it’s mostly just the figures and pictures.